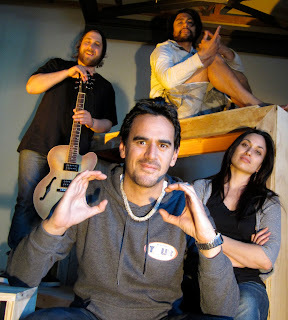 The world premiere of MANAWA by Jamie McCaskill (He Reo Aroha, Robin Hood) opens this Saturday at Circa Two. Shocking, challenging and very funny, the play explores our contemporary justice system and the media’s role in high profile criminal cases. Jimmy King is loosely based on Bailey Junior Kurariki, New Zealand’s youngest killer. Like Kurariki, Jimmy is caught up as an accessory to the crime and there starts a life in and out of prison. Kali Kopae (Beat Girls, He Reo Aroha, Robin Hood) plays Waimanea Huia, a ruthless lawyer determined to steer Jimmy away from his past and into rehabilitation. Mau Vaianga has recently arrived in Aotearoa from Samoa, played by Natano Keni (Lord of the Rings, Once were Samoans), has been accused of a crime against a kakapo committed out of ignorance and it results in public outrage and a media storm. Waimanea gleefully takes on his case and therein starts the enthralling narrative full of twists and turns. Mau and Jimmy become unlikely friends stuck in a prison cell together. Audiences will be treated to a live soundtrack by extremely talented Thames musician Simon Donald, a stunning set by Bryan King and inspired lighting design from renowned practitioner Jennifer Lal. "Jimmy king is a career criminal who has been in and out of jail for most of his life. This play is just a slice of Jimmy’s life in his 30’s where he has realised who he is and how he fits in the world. We also show a softer side to Jimmy that should give the audience a sense of hope and empathy for this very flawed character. I look forward to bringing him to life on stage." "Waimanea is a strong confident academic who throughout her life has succeeded in everything. Her Iwi have put her through law school, so she has some obligations. Throughout the play you can see her arrogance as confidence blinds her, pushing for a result that will benefit her career rather than her clients’ real needs. Though she may come across as a steam roller, there is a soft side to this woman, who really does know right from wrong and if circumstances were different she would go down the right avenue. Bringing Waimanea to life will be a challenge that I look forward to." "Mau Vaiaga is a representation of hopes and dreams about a son of Samoa who has gone abroad in search of a better life for their family. Having the opportunity to play Mau Vaianga I hope to reveal a new Samoan character with hopes and dreams, being a respected man at home and what happens when he is lost in translation in a new country." Manawa opens on 15 September and runs until 13 October - $25 tickets on Friday, 14 September and Sunday, 16 September. To book, call the Circa Box Office on 801-7992 or go online www.circa.co.nz.